“Happy Deceptive Thanksgiving!” is what Del Monte should start adding to their marketing slogan. 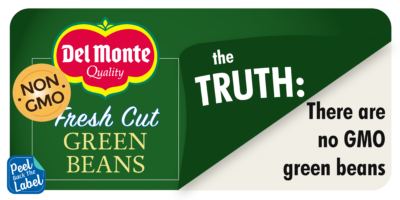 Each can of Del Monte’s Fresh Cut Green Beans has a Non-GMO label on it, but its only ingredients are green beans, salt and water. News flash! There are no GM versions of green beans on the market, salt is a mineral and doesn’t have genes to modify, and water is made of molecules with no genetic material to modify either. With families increasingly going out to dinner on Thanksgiving instead of cooking a homemade meal, and an onslaught of creative new side dishes being prepared as alternatives to Grandma’s green bean casserole, Del Monte must be feeling the pressure to make their green beans still seem desirable. Unfortunately, they’re choosing to strike fear in consumers by slapping a “Non-GMO” label on their product in an attempt to trick shoppers into thinking that this label makes their product better than the alternatives. Del Monte, you can do better. Stop taking the easy way out and confusing consumers. Do the legwork to make your product more appealing through truthful and transparent marketing. Tell Del Monte to value facts over fear on Twitter, Facebook or writing to them today.